Be sure to check out this sleek 65' Pearl yacht for sale in the USA! : Atlantic Yacht & Ship, Inc. This beautiful USA 65′ Pearl yacht is offered for sale by Randy Kires and is located in Florida. In the first place, this 65′ Pearl yacht is a 2017 model so she is brand new. In fact, this 65′ Pearl is the first one to arrive stateside. Similarly, this boat was specifically built to US specifications. In a word, this is your opportunity to take advantage of new model pricing before more of these boats arrive stateside! Furthermore, with a galley-up layout, she is perfect for cruising around the Americas! To sum up, this new 65′ Pearl Yacht has four staterooms for guests. This is along with two separate berths aft for crew (or the kids). Therefore this 65′ Pearl has overnight accommodations for ten. She has been designed for tropical getaways with her upgraded tropical-grade air conditioning. Don’t worry about having enough power either. With an upgraded generator system you will never have to be concerned for load management. With a hard-top and hydraulic platform this yacht has all the features! Moreover, the IPS joystick control for her Pod Drive propulsion makes maneuvering simple. 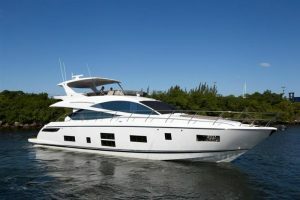 For more information on this beautiful new 65′ Pearl Yacht for sale in Florida be sure to contact Randy Kires today!